Support Clean Water with a Gift for the Kaw! In March of 2014, the Corps of Engineers (COE) announced that a new Environmental Impact Statement (EIS) would be required to reauthorize dredging permits on the Kaw. The COE “was unable to conclude that there are no potentially significant impacts associated with the activities proposed by dredging companies.” The new EIS is a positive development, but there’s still work to do. Commercial sand and gravel dredging have seriously degraded the Kansas River, and to prevent additional damage all operations should move to appropriately sited pit mines in the Kansas River valley. When it comes time for the public meeting that will be held in the fall of 2015 we’ll need you to submit your comments in support of protecting the Kaw. We’ll keep you updated! 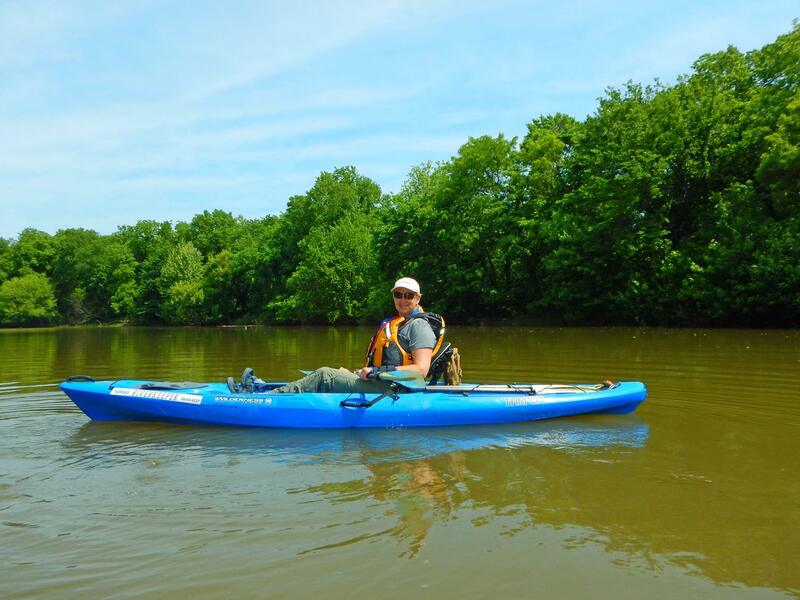 The Kansas Department of Wildlife, Parks and Tourism, with the assistance of the National Park Service and Friends of the Kaw, has continued to improve the Kansas River Water Trail. With the participation of Westar’s Green Team informational kiosks have been built at many of the access ramps, including the De Soto ramp. In June of 2015, our Kansas Riverkeeper, Laura Calwell, was honored by the River Network as a River Hero. This award is peer-nominated and given yearly to five individuals who have dedicated themselves to protecting our most vital natural resource—water. After years of service, Laura will be retiring in the near future, so we are actively seeking applications for a new Kansas Riverkeeper. Visit the job description page for more details. Finally, as we approach the end of the year, please consider making a tax-deductible gift via PayPal or by sending a check to Friends of the Kaw, P.O. Box 1612, Lawrence, KS 66044. Your gift will support efforts to protect the river, including getting dredging operations out of the river. Already an FOK member? Consider giving a membership as a holiday gift! Over 800,000 Kansans depend on the Kaw for drinking water, and it is only through working together that we can protect this valuable resource for future generations. Thank you for your continued support of Friends of the Kaw. From all of us at FOK, have a wonderful holiday season and best wishes for the new year! Your gift to Friends of the Kaw helps FOK keep dredging out of the river, report and follow up on pollution violations, advocate for reduction of stormwater pollution from both urban and rural areas, and demand enforcement of the Clean Water Act. Documentation and monitoring of sand dredging operations by visually monitoring dredge sites and communicating with the Corps of Engineers. Following progress for new Environmental Impact Statement. Responded to eight pollution reports including trash, concrete & asphalt dumping, oil spill in KCK; questionable application of herbicides in Lawrence; questionable waste management practices; and a questionable discharge from a pit mine operation. With assistance from Westar’s Green Team, KDHE, REI and the City of De Soto cleaned up the area just below the De Soto access ramp. Ww also made arrangements to clean up 500 tires and other debris below a Westar power line just east of Lawrence for March of 2015. Provided input for the Vision for the Future Water Supply in Kansas via the Basin Advisory Committee and a consortium of Kansas environmental organizations. Promoted and made comments on EPA’s Waters of the U.S. Proposed Rule. Organized and led twelve educational float trips for over 400 people. Provided five Boys and Girls Club paddling experiences in conjunction with day camps organized by the National Park Service and Freedom’s Frontier. Thanks to our volunteers who spent the morning paddling with the kids! Worked with the KS Department of Parks, Wildlife and Tourism and the National Park Service on promotion of the KS River Water Trail, and helped organize a community float attended by over 50 paddlers on October 8, 2014. Developed the Kids About Water (KAW) project, a water quality issues and actions curriculum for grades 6 -12. Fundraising Events: Catfish fry in Lawrence and the Annual Dinner and Silent Auction at Olathe’s Bass Pro Shop. MARK YOUR CALENDARS! The Wild and Scenic Film Festival will be held on April 30 at the Glenwood Theater in Overland Park and on May 1 at Liberty Hall in Lawrence. CONSIDER GIVING A MEMBERSHIP AS A HOLIDAY GIFT!